There is something pure about the air in the mountains and when it is one that is off the tourist track, there is an unmistakable charm to it as well. Lansdowne is one such quaint hill station that will feel straight out of a fairy tale with its verdant vistas, greenery, beautiful landscapes and more. 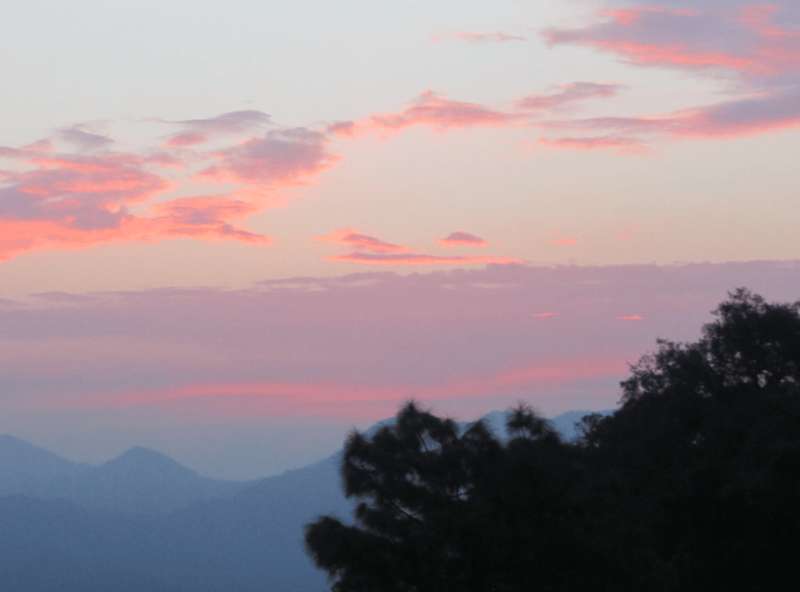 The sound of a bird sound attracts me as on my early morning walk in Lansdowne as I am hurrying to catch the sunrise. I stop and look for one and see some movement in a shrub and a flashes of blue and brown but no bird. I am wondering if I should move or wait for a bit and decide on the latter. And soon enough I am patting myself on the back as I spot a black headed jay. Feeling elated, I know that this will be a trip filled with great memories. Located in Uttarkhand’s Garhwal district, Lansdowne is a quiet hill station located 5800 feet above sea level and secluded amidst Oak, Rhododendrone, Kafal (a type of raspberry) and Pine trees. Locally the place is also known as Kalodanada or Black Hill and has been named after Lord Lansdowne, the Viceroy of India from 1888 to 1894. There is still a strong cantonment culture in this hill town. 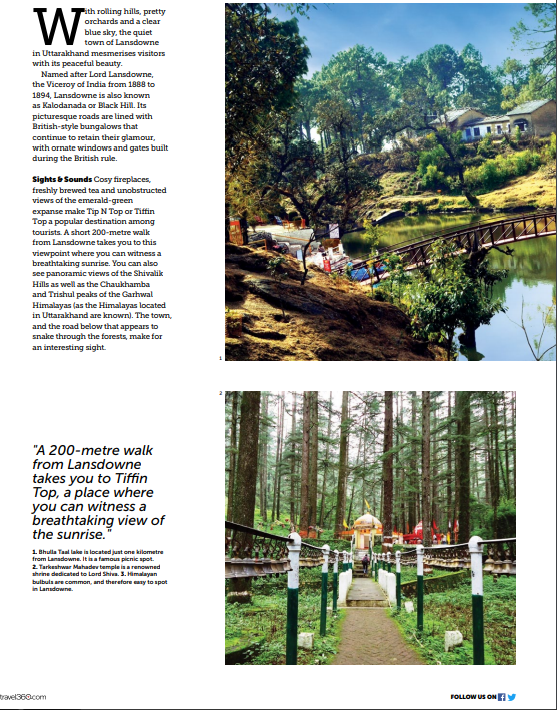 Being in the hills, the views are naturally spectacular so I decide to head to Tip-In-Top or Tiffin Top that can be accessed with a short 200 meter walk. A picnic spot that is also a vantage view point, this is where you must start your morning as you will see the most amazing sunrise from here. 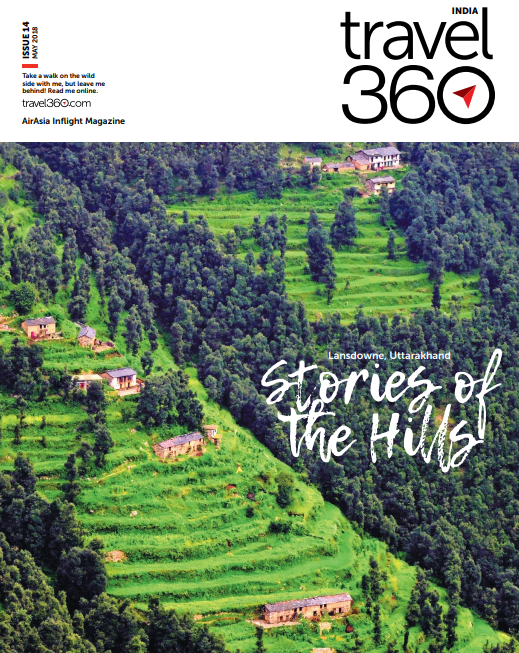 You also get to see panoramic views of the Shivalik Hills as well as the Chaukhamba and Trishul peaks of the Garhwal Himalayas. You can also see the town and the road below that appears to snake through the forests. This is also among the best place to spot birds. 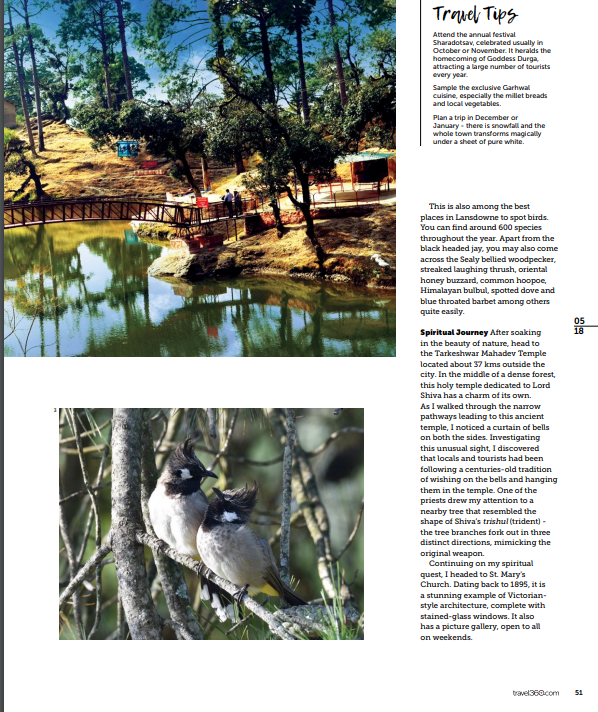 My guide tells me that at least 600 species of birds can be seen in Lansdowne throughout the year. Apart from the Black Headed Jay, you can also spot Sealy Bellied Woodpecker, Streaked Laughing Thrush, Oriental Honey Buzzard, Common Hoopoe, Himalayan Bulbul, Spotted Dove and Blue Throated Barbet among others quite easily. After soaking in the beauty of nature, head to the Tarkeshwar Mahadev Temple located about 37 km outside the city, an ancient holy temple of Lord Shiva. You will need to walk quite a bit as the temple is in the midst of thick forests but a covered path has been laid out. As I was walking alongside the path, I noticed a string of bells of different sizes tied on either side and was told that these are tied by devotees who offer prayers and come back once their wishes are fulfilled. Bells are also offered on special occasions. The priest here points out one of the trees above the temple that is in the shape of Shiva’s trishul and sure enough the tree branch has forked out on either side forming the shape of the trishul. For some more spiritual insights, head to the a lovely example of religious tolerance where there is a merger of Roman Catholic and Hindu faiths. This is where the statue of Jesus Christ is the lotus yogic position and Mother Mary is dressed in a sari. This is a place where you can stay for a few days and reconnect with your inner self. 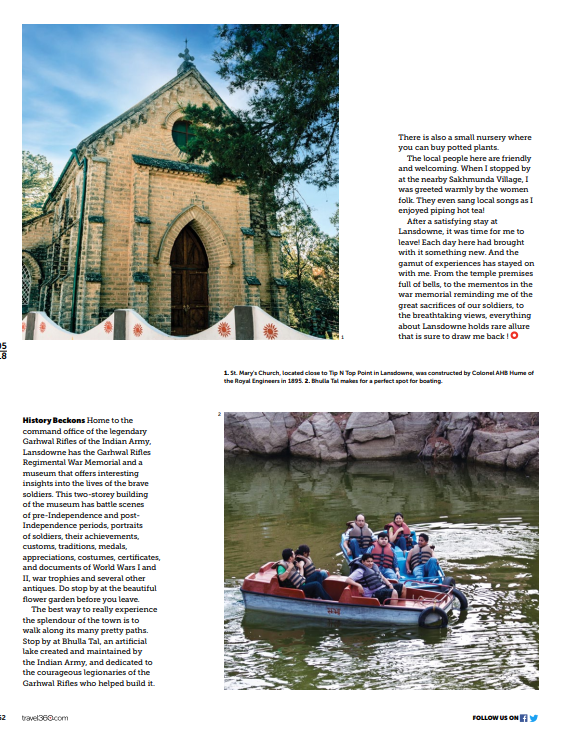 The other place that is a must see is the St. Mary’s Church that dates back to 1895 is a stunning example of Victorian style architecture complete with beautiful stained glass windows. It has a picture gallery and is open only on the weekends. Home to the command office of the legendary Garhwal Rifles of the Indian Army Lansdowne has the Garhwal Rifles Regimental War Memorial and a museum that offers interesting insights into the lives of the brave soldiers. The two storey building has battle scenes of Pre-Independence and Post-Independence periods, portraits of brave soldiers, achievements, customs, traditions, medals, appreciations, costumes, certificates and documents of World War I and II, war trophies, and antiques. Do stop by at the beautiful flower garden outside before you leave. Photography is however, not permitted inside the museum. The best way to soak in the culture here is to walk along the many beautiful paths in this area. This is where you can see nature abound. Stop by at Bulla Tal an artificial lake, created and maintained by Indian Army and is dedicated to the young Garhwali youth of Garhwal Rifles who helped build this lake. This is where you can enjoy some boating and kids can have fun in the children park here. There is a small nursery here where you can buy potted plants too. The local people here are friendly and when I stopped by at Sakhmunda Village I was greeted warmly by the women folk who even sang local songs as I enjoyed piping hot tea. As I was here for a couple of days, it was time to leave and as I looked back all I can say is that Lansdowne was a revelation in more ways than one and I had to come back to unravel its other secrets. By Air: The nearest airport is Jolly Grant Airport in Dehradun at a distance of 117 km. By Train: The nearest railhead is at Kotdwar, at a distance of 40 km. 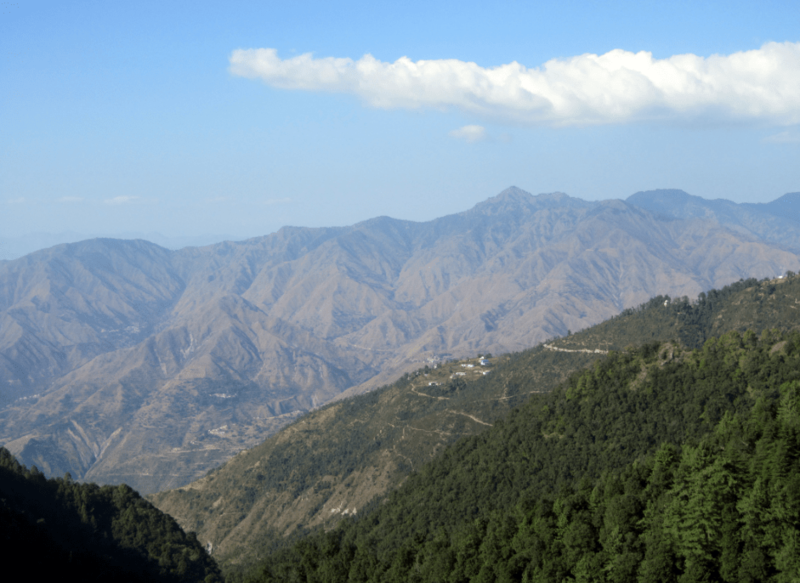 By Road: Lansdowne is connected to Kotdwar, Haridwar, Dehradun, Mussoorie and Delhi by bus. Accommodation: There are plenty of accommodation options in Lansdowne across budgets. The annual festival Shardotsav celebrated in autumn attracts large number of tourists. It snows here usually in Dec-Jan and the whole town transforms magically under a sheet of white. 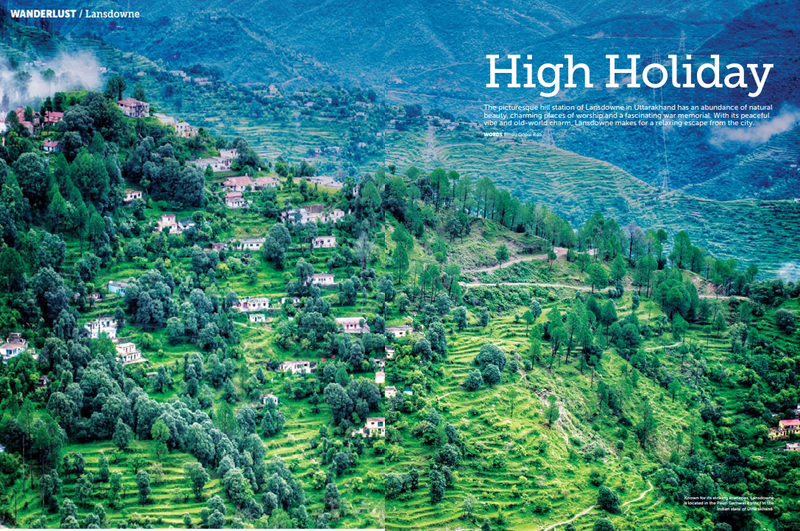 Sample the Garhwal cuisine especially the millet breads and local vegetables. Next Next post: Kempegowda International Airport (KIA) – What’s New?